The COFFEE QUEEN CATER is a quick and flexible brewer that brews coffee directly into an elegant 2.5 litre serving station (thermos) that comes complete with a hot water outlet and level indicator. Available as a single or double brewer, the CATER, has been designed to fit into all environments and allows you to serve a great tasting coffee in as little as 6 minutes. The CATER has automatic water filling, full and half brew functions, a built in 5 litre water tank and a hot water tea outlet on the front of the machine. The single CATER comes equipped with a 2.5 litre serving station and has a brewing capacity of 20 litres/hour. The double CATER includes two 2.5 litre serving stations and has a brewing capacity of 40 litres/hour. A water connection hose is also included with both units. 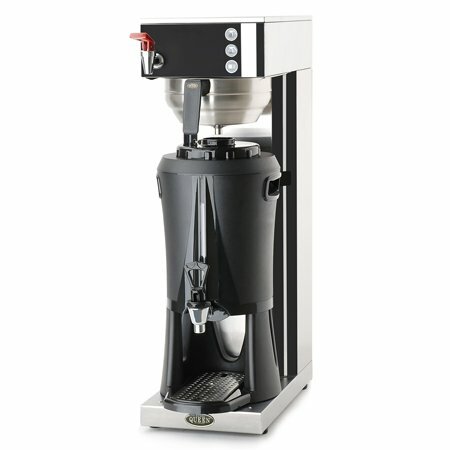 The COFFEE QUEEN ORIGINAL brand is part of a complete series of classic filtered coffee machines. Machines that for decades have earned a great reputation in top end hotels and other environments where guests demand a great tasting coffee. These machines are built based on proven technology that has been complemented and refined over the years with new innovations. The results are great valued filtered coffee machines that you can rely on and will be able to use for years and years to come.